Wow, there are so many feminisms—I only feel authorized to speak about my own personal version. 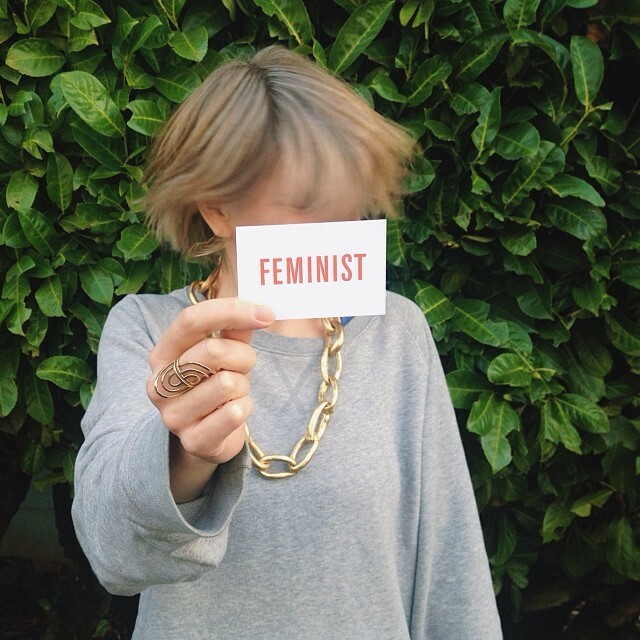 I am interested in feminism as a site to explore how power moves. I am most drawn to a feminism that transcends the question of "women's lib", and instead asks, "How is power distributed—globally, nationally, culturally, socially? How could it be redistributed?" So, for example, last year I was talking with a friend and I was like, "You can't just have a 'women's movement', feminism is about engaging with racism and poverty and all these other systemic power imbalances." And said friend replied, "I think that's social justice, not feminism." It was so shocking to me because my vision of feminism was borne out of the nineties indie/punk scene and academia, both of which engaged with feminism always in-tandem with class, race, sexuality, etc. Audre Lorde really hit the nail on the head when she wrote, "There is no thing as a single-issue movement because we do not lead single-issue lives." This couldn't be more true. Now more than ever. We're knee-deep in the internet age. We're entering a one-world epoch, where so many current global and national crises are about the letting go of the long-held illusion of separateness and "otherness". We're all in this together. There is no "them" only "us". Unsurprisingly, this conversation was happening around the time when Lean In came out, which best I can tell (having not read it) isn't about dismantling existing power structures or even providing a useful critique of them. Rather, it seems to be a book written about a narrative of lack, specifically that women lack access to certain forms of power. And so of course, when you're looking at the world through that lens of scarcity, you're preoccupied with the question of how to get more. In this case more power, prestige, money and validation. What's invisible here are all the assumptions about our collective values. This narrative assumes (and therefore reinforces) that money equals merit, that the world is a pyramid and it's better to be on the top than the bottom, that the problem of equality is just a numbers game and that having more slots filled by women will mark some sort of cultural shift. So, I've been wondering if maybe the whole thing is upside down and it's not about women not having enough, but rather men having too much. How about a book that explores the current (male) corporate leadership model (and American values writ large) as a failure of excess? I'm interested in what top-tier execs are missing/losing by working long hours, by prioritizing profits over people, and maintaining hierarchical workplace structures. How does this affect them psychologically, biologically, socially and in their familial relationships? I want to know about that, not about how women can slide into their desks. The statistics about how much money women make vis-a-vis men seem to be getting a lot of attention again, but what if the question was no longer, "Are women not making enough?" but, "Are men making too much?" But anyway, back to the single-issue movement and the question of feminism being about women. Because, of course, you have to ask, who are these women you mean when you say feminism is only about women? Because if a woman who is working under very unsafe conditions at a garment factory in Bangladesh, for her feminism requires an engagement with worker's rights, environmental issues, trade agreements/international policy, American consumerism and so on. And further, if feminism is only for women's rights, what is a "woman" and what are "rights"? It might sound silly, but I'm being serious here. The idea of imagining a global power shift around and for women automatically leaves out half of the people on the earth. Half! That's so many! How radical would it be if we developed a vision that serves everyone in becoming empowered? If you look at the word empowerment, "em" means within, to have power within. Equality is concerned with the externals of power. But empowerment requires an engagement with the self. How do we create conditions that give people a sense of personal power? Of agency, dignity, voice and the self-esteem to make wise choices in their highest good? Right now, I'm really interested in is what my friend Lisa calls feminine-ism. I don't mean a celebration of all things girly or a sexualization of womanhood. I mean valuing characteristics such as empathy, receptivity, nurturance, introspection and gentleness. Eastern thought has long understood "masculine" and "feminine" as principles that extend beyond "man" and "woman". Dislocating femininity from womanhood and beginning to see it as a collection of qualities deserving of reverence serves both men and women in their journey towards wholeness. Our rejection and denial of the feminine has manifested as physical and sexual violence against women, queers and others feminized subjects. It has also alienated us from each other, from the earth and from our own souls. I think that meeting shame and rejection with acceptance and embrace is a big piece of our task at hand. If I might be so bold as to say... I think the fourth wave is feminine. What do feminists look like? Human, generally. Though I suppose not exclusively. Developing new mythologies borne of our personal truths is absolutely crucial to re-imagining our relationships with each other and the natural world. I think this was what Cixous was saying in the Laugh of the Medusa when she wrote, "Woman must write herself." All of our wisdom, power and knowledge resides within. We (humans) don't need outside validation, permission or expertise to find our truth. Our society (religion, politics, media) tells us every day that we do. This is a a lie. Our biography, our soul, provides us all the answers we seek. Our challenge is to learn how to ask the question and then receive the answer. The baby dolphins offered a very powerful experience that contained so much truth and beauty that it will undoubtedly provide a powerful touchstone for Katherine and those who shared the magic. We each have our baby dolphins—that thing that takes you home when you are most adrift. Or, if you don't have it yet, it will surely come. The opportunity, which was so eloquently seized here, is to see these encounters for what they are—talismans on our path, helpers on our journey, reminders of our free and loving selves. Posted on September 30, 2014 by Carville Annex Press. Buy an ad in our magazine below for so much fame and glory! A hand drawn ad in the Actually People magazine we are making right now, which will come out sometime in January.